In 2005, the U.S. federal government began collecting statistics when the rate of bullying was around 28 percent. Three of every ten kids went to school knowing they’d be harassed, even physically harmed. In a civilized society, this rate should be considered completely unacceptable. Ready for another troubling statistic? In this article, we’re going to discuss eight signs of bullying and what can be done to encourage a child to speak up. In addition, we’ll provide some resources to assist with the problem. Bullying can be devastating to a child’s self-esteem or self-worth. Sudden or behavioral and personality changes may be difficult to observe at first, however, these changes will gradually become more apparent as the bullying continues. As soon as these changes become apparent, it is necessary to try and get to the root of the issue. In cases of extreme bullying, the child may show injuries they can not explain. Bruises and swollen areas are among the most common types of injuries. Bullies generally avoid the face area due to the fear of being found out; instead focusing on the torso and legs. A child who cannot explain an injury may be experiencing physical harm from their peer(s). – 21% of high school kids report missing school because of bullying. – 11% report missing school because of electronic bullying (cyberbullying). Not only are kids subject to in-person bullying when they attend school, but it also doesn’t end once they’re out of class. Due to the rapid growth of social media, they’re often harassed on Facebook, Instagram, and other social platforms. Unsurprisingly, bullying negatively affects a child’s engagement with their schoolwork. Lack of study time correlates to declining academic achievement (see below). Sadly, this trend is worsening because of the amount of technology kids have available. They’re more likely to use a computer or mobile device as a means of an ‘escape’ than leveraging them for learning purposes. “One of the things that is being reported is the significant amount of peer pressure exerted by certain girls to ‘not eat lunch,” she continues, “Girls are avoiding eating or throwing out their lunch for fear of rejection by cliques.” Boys also face pressure in this regard but to a lesser degree. One of the more tragic outcomes of bullying is a child not fulfilling their potential. School is supposed to be a place for learning and development. Children who are bullied do not see school in this light; they see it as a place to be avoided. Poor academic performance further hampers a child’s self-esteem and may alter their life choices; potentially even their future. If a child is performing below their capabilities, a serious discussion is in order. As stated above, bullying can hurt a child’s mental health. In cases of abuse., the longer it continues, the worse the mental health outcome. Long-term bullying of a child alters their brain’s chemistry during a time when the brain is developing rapidly. The negative effects of this cognitive change can be seen in alcohol and drug abuse statistics, and rates of self-harm or suicide. If you’re a parent, you understand what it means to have a parental instinct. Something isn’t right with your child, and you just can’t put the finger on it. Intuitive and observant adults, even those who aren’t the child’s parent, may sense something is amiss. Do NOT ignore your instincts. Be the responsible adult and take the initiative. If you’re a parent or teacher, you are in the best possible position to uncover what – if anything – is going on. Remember, over 60% of bullied kids don’t tell anyone. After asking the question, watch the child’s reaction. What they do not say is often more important than what they do. Watch their body language for fidgeting, and see where they direct their eyes. If a child is silent or has no reasonable explanation to your question, it’s important to persist and attempt to uncover the truth. 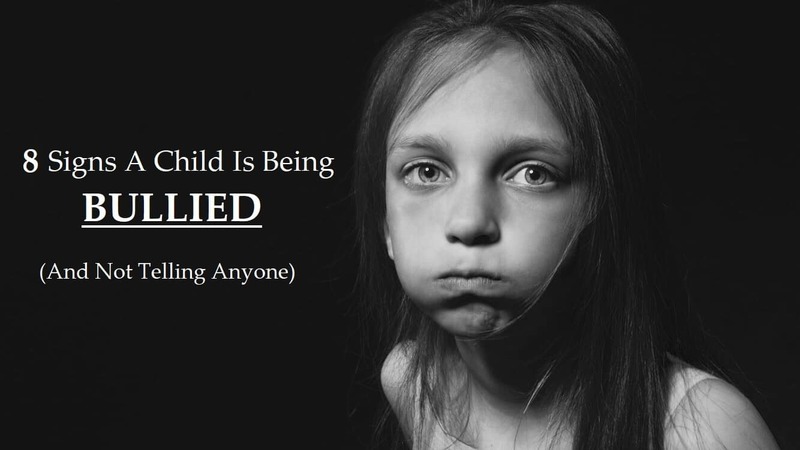 If the child is being bullied, take the appropriate actions. For more information on bullying, including professional advice, please see www.stopbullying.gov. A group of ambitious students has developed a smartphone application called ‘Be Strong’ available on iOS and Android. Be Strong gives students who are being bullied a wealth of coping resources, and is free. As adults, it is up to every one of us to do what we can to help a child facing bullying.